After a near-mutiny in which the crew probably forced his hand, Hudson gave his crew notice that he was returning by his own hand, without any force on their part, probably a fabrication demanded by the crew so they won't get charged with mutiny and hung. After three months, Henry Hudson was ready to sail again, in the same ship and for the same company as his first voyage. This time he went looking for a Northeast Passage through the Arctic waters north of Russia. Among his crew was Robert Juet who would play an important role as a troublemaker in this and Hudson's subsequent voyages - and as chronicler in 1609. Click image for a map of this voyage. Hudson was employed by the Russia Company (also called the Muscovy Company - the "merchants who trade with the Muscovites") to explore the coast of Siberia much further east than the area previously reached by Stephen Borough in 1556. The merchants wanted an alternate trading route in case the good relations currently established between England and Russia might not survive when the elderly Tsar Ivan the Terrible died. They wanted to grab some of Spanish trade in the Far East by taking a direct sea route to Japan and Cathay (China) across the seas north of Asia. Queen Elizabeth's court astrologer, Dr. John Dee, was also adviser to the Muscovy Company. He was convinced there was a sea passage, a belief shared by his contemporary geographers and mapmakers Mercator and Ortelius. Although his father, Richard Hakluyt, the lawyer, agreed with Dee, the younger Richard Hakluyt was less confident that the passage existed. Dee, however, had lost favour in the court following the death of Elizabeth, and himself died in 1608. The founding governor of the Muscovy Company, Sebastian Cabot, had also believed in the existence of this passage and had organized several unsuccessful expeditions to search for it, before is death in 1577. 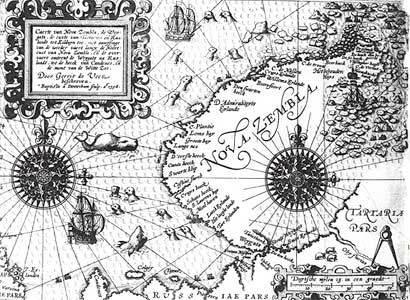 Hudson's observations about the sea proved him an able navigator, but he was unable to get through the ice-laden waters past the islands of Novaya Zemlya (Nova Zemlya or also Nova Zembla). He turned around and was planning to try for a northwest passage, but was prevented from doing so when his crew found out they weren't going home. He was able to placate his crew only by turning for home and writing a letter saying they had not forced him to do so. Hudson's failure to make any significant discoveries or progress - and possibly his obvious problems with the crew - made the Muscovy Company lose interest in further exploration of the north. The Northeast Passage was not traversed until Nils A. E. Nordenskjöld of Sweden accomplished the voyage in 1878–79. It had been eight months since Hudson's last voyage. He sailed again as captain of the Hopewell (first used for Arctic exploration by John Knight in 1606) for the Muscovy Company, which directed him to "finding a passage to the East Indies by the northeast." He decided to sail the then-unknown waters north of Russia, where the late Sebastian Cabot and others believed sailors would find an open passage to Cathay. The Hopewell was strengthened with extra planks to help it make its way through icy waters. Robert Juet (Ivett), 50, was aboard as master seaman. Hudson wrote to Hakluyt, describing Juet as a man "filled with mean tempers." Juet appears to have kept a separate journal of the 1608 voyage, but Puchas omitted to reprint it when he printed Hudson's journal, noting only he did so "for brevity." That journal, along with other original records of the voyages, have since been lost. Juet was one of the few literate men onboard, aside from Hudson. A crew of 14 only included three members who had sailed with Hudson to the Arctic previously (in his first voyage). His young son John was also aboard, for a total of 15. Included in the crew were: Robert Juet, master's mate; Arnall Ludlowe (Arnold Ludlow or Ladle); John Cooke, boatswain; Philip Stacie (Staffe), carpenter; John Barnes; John Braunch, cook; John Adrey; James Strutton; Michael Feirce; Thomas Hilles; Richard Tomson; Robert Raynor (Rayner) and Humfrey Gilby. 22: Hudson left St. Katherine's Docks, on the Thames, London. According to Philip Vail, an Anglican priest blessed the voyagers, but Juet didn't take part in the religious ceremonies. He was busy entertaining friends in his quarters. Hudson was forced to turn out Juet's guests in order to get underway. "The nose of Master Juet was put much out of Joint," Vail says Hudson wrote in his journal. "When I desired to retire to my sleeping cabin, J. was still in foul humours, and had to be summoned to take the watch." If true, this was an inauspicious start and indicates bad feelings between Juet and Hudson from even before the first day they sailed together. Chamberlain puts the date of sailing as April 25. Hopewell sailed northeast for a month, rounding the northern tip of Norway in late May, then went on into the Barents Sea. Bad weather and cold forced Philip Stacy, the ship's carpenter, and three or four others, into their bunks with illness. 3: Sighted North Cape at 71°N. In early June they encountered ice and tried to go through it. Hudson almost got trapped in the ice, but backed out in time before the ship took serious damage. 8: Hudson noted the colour of the sea changed near ice. 15: Two crew members - Thomas Hilles and Robert Rayner - sighted a mermaid at 75° 7' N, and shouted at the rest of the crew to come and look. Hudson recorded it in his log as having a "tail of a porpoise and speckled like a mackerel." She was "looking earnestly on the men" who gathered on the side to see her. The description Hudson wrote says she had very white skin, "speckled like a macrell" (mackerel), long black hair, white skin and a woman's breasts - with the tail of a porpoise. By the matter-of-fact record, it seems obvious Hudson believed in mermaids. 18: The Hopewell reached the ice barrier to the port side. "Very fearful to look on," wrote Hudson. 22: At 74° 35'N, surrounded by ice, Hudson sailed southeast. 26: They sighted land at 72° 25'N, about 12-15 miles away. 27: Hudson reached the islands of Novaya Zemlya, north of Russia, but could not go further north because of the ice. He tried to go south around the islands to the Kara Sea on the other side. The Kara is usually blocked by ice, except for August and September. He reached calm waters two miles offshore, and stopped. He dispatched Juet, mate, and John Cooke, boatswain, to lead a party of six ashore to "see what the land would yield that might be profitable and to fill two or three casks with water." The men returned with deer antlers and whale fins, and reported the presence of grass and streams, as well as tracks of bear, deer and fox. They also returned with pieces of a cross they found ashore, and reported seeing another cross at a different location as well - a sign others had been there before. Their boat was followed back to the ship by a herd of curious walrus, but the crew were unable to catch any ashore. 30: Hudson sent his crew back to land to look for the walrus, thinking they may have arrived by warm currents. Although they spied 40-50 of the animals asleep on a rock, they were only able to shoot one, and brought back its head as a trophy. During the night, their anchor broke free and the ship went aground, but was pulled off without further damage. 1: Ice near the ship was moving northwest. Hudson sent some crew to explore the sound and a river at the head of the bay. 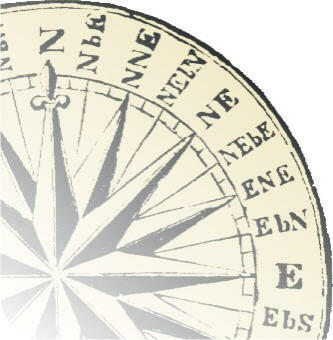 Hudson wrote he hoped to navigate south of the island, but north of the Cape of Tartaria (Cape Tabin). 2: Hudson spotted a "fair river" on the island, "six to nine miles broad, its depth exceeded 20 fathoms" the colour of the sea and "very salty with a strong current setting out of it." He turned the ship to explore it, but barely escaped a collision with an iceberg. It took the crew all day to fend the ice off with beams and spars, while pulling the ship out of its path. 4: Hudson sailed 15-18 miles upriver but the water became too shallow to continue - down to one fathom (about six feet). He sent Juet and five or six others in a boat to explore the river. This action was similar to what he would do in the New World river that now bears his name. 5: The crew returned after travelling another 18-24 miles upstream, saying it became too shallow to go further. They said they saw many deer while they travelled. The mate Ladle (Ludlow) went ashore with four crew to hunt for walrus, but didn't find any. Instead, they shot almost 100 birds called 'wellocks.' Hudson decided there was no passage around the island this way and gave up his quest to get past Novaya Zemlya. He secretly decided to sail for North America, but didn't tell his crew. 6: Hudson decided to look for 'Willoughby Land' (Willoughby Island), which was actually a 'conceit' of map makers and didn't exist. The Hopewell set sail west and southwest, heading back the way they came. They travelled through considerable rain and bad weather for the rest of the month. 11: Hudson again noted a green sea and a "black-blue colour sea...is a sea pestered with ice, according to last and this year's experience." He was the first mariner to record the changing colour of the water with the proximity of ice. 26: Hudson noted the crew has to burn lights again at night because the midnight sun is no longer with them. 30: Off the Lofoten Islands, north of Norway. 7: When the crew realized they weren't going home to England, they got angry. After a near-mutiny in which the crew probably forced his hand, Hudson gave his crew notice that he was returning by his own hand, without any force on their part, probably a fabrication demanded by the crew so they won't get charged with mutiny and hung. "I used all diligence to arrive at London," Hudson wrote in his journal. "and therefore I now gave my crew a certificate under my hand, of my free and willing return, without persuasion or force by any one or more of them. For when we were at Nova Zembla on the 6th of July, void of hope of a Northeast Passage...I therefore resolved to use all means I could to sail to the northwest." Although he recorded in his journal his belief that a passage lay through the Furious Overfall, he headed back to London. Historians have speculated that Robert Juet was the man behind the crew's insubordination. Thomas Janvier called him Hudson's "evil genius." 26: The Hopewell returned to Gravesend, England. After his failure, the English lost interest in his goal of a Northwest Passage. The Company directors were disappointed in Hudson's efforts and probably had lost confidence in Hudson's abilities. The Company refused his request for another voyage with more men and less rigid orders. With no employment for him in England, Hudson went first to the Dutch, then to the French, looking for sponsors. Cold at first to his plan, at the end of 1608, the Dutch decided to hire him, probably to prevent their rivals, the French, from hiring him. For details, see the story of Hudson's third voyage, 1609.